Now a Vancouver mainstay and member of Brave Irene, Rose Melberg has major indie pop tenure thanks to time spent in groups like Tiger Trap and the Softies. 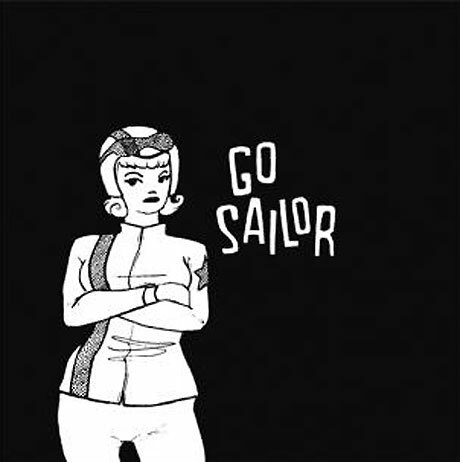 In the mid-'90s, Melberg also teamed up with Henry's Dress member Amy Linton and Crimpshrine's Paul Curran to form Go Sailor, a California-based pop punk project that only put out a few vinyl-only releases and made some compilation appearances before disbanding. In 1996, Lookout Records compiled all of Go Sailor's material on a CD, which was good news for fans of the band who wanted the material, but bad news for those of us that love vinyl. Thankfully, the dream pop lovers at Slumberland have decided to press a limited vinyl edition of the comp as part of their new vinyl-only Slumberland Archive Series. While the tracks on the LP are the same as the Lookout CD, they apparently play in a slightly different order, though that tracklist has yet to be revealed. But that's the cover above and Go Sailor will be released on June 14 via Slumberland. Go Sailor will follow Slumberland's 20th anniversary shows in 2010 with another reunion at NYC Pop Fest, which runs from May 19 to 22. More information on that is available here.